Even in an area with a rich population of red foxes, it's a rare treat to see a silver fox. Their pelts are so drastically different than their red furred counterparts that they seem too fantastical to be real. 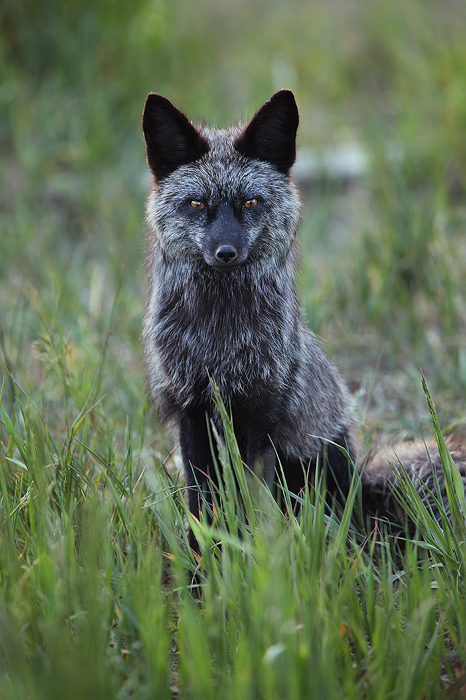 In actuality, silver foxes are just a rare color phase of the red fox. Historically, the pelt of a silver fox was among the most valuable of furs, and were worn by nobles and others with the means to afford such a highly esteemed pelt. Today captive bred silver foxes are mated exclusively with same colored individuals, but this is not the case in the wild. This beautiful black vixen, and her red colored mate have a litter of three small red kits.